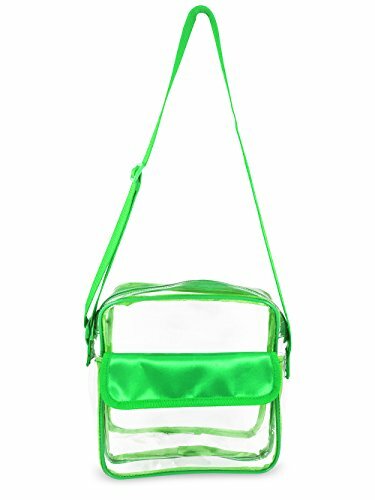 This is a clear cross-body bag with a long adjustable strap that makes it a multifunctional accessory. At its longest adjustment the clear bag strap easily sits over the shoulder while the clear bag itself rests comfortably on your hip. At the shortest adjustment the strap becomes a double handle allowing you to carry it as a clear handbag. There are two pockets on these clear handbags. One large roomy pocket with a zipper enclosure on the top. It is large enough to carry your cell phone, wallet, keys, and a 12 oz water bottle. The second pocket is a smaller one located in the front with a Velcro flap which allows easy access to things like your football game tickets, ID, or credit card. Of all the stadium L approved clear bags, stadium clear tote bags, and clear tote bags for work, this one is easily the most fashionable. It is also waterproof (when not submerged) keeping your things dry if a light shower rolls in. If you have any questions about this product by Nova Sport Wear, contact us by completing and submitting the form below. If you are looking for a specif part number, please include it with your message.